Wow! Been traveling by land for 50 days already! Arrived in the capital of the Netherlands at about 2pm. Amsterdam is known its impressive architecture, lovely canals, windmills, cheese, clogs, tulips, high tolerance of drugs and its red-light district. Amsterdam is a city of canals. But it is nothing like Venice. The feel and architecture is very different. I kinda like Amsterdam because I felt very relaxed and comfortable here. And it is easy to walk around. Amsterdam is also one of the most bike-friendly cities in the world. There are more bicycles than humans in Amsterdam! There are approximately 750,000 people living in Amsterdam but they own about 800,000 bicycles! Apart from walking, renting a bicycle is a great way to explore the city. For food, I had to try their Dutch Pancakes. The traditional way to eat it is with Dutch Syrup. So that was what I ate! It tasted somewhat similar to the French Crepes yet you could still tell the difference. Very nice! One of the must-see places in Amsterdam is Anne Frank's house. This was the place where the young Jewish girl named Anne Frank hid from the Nazis for 2 years until her family was anonymously betrayed. The people who hid in the house were subsequently arrested and deported to the concentration camps. Anne Frank and her sister Margot died in the concentration camps just a few weeks before the liberation by the British Troops. Anne Frank's The Diary of a Young Girl was written in the house and is one of the world's most widely read books. I was really amazed at how she and her family hid in the "secret annex" of the house. From the outside, you really can't see how big the house actually is. I can't even imagine how difficult the living conditions were at that time. Evey day of her life there must be in total fear. Went back to the hostel to rest after 1 whole day of walking. 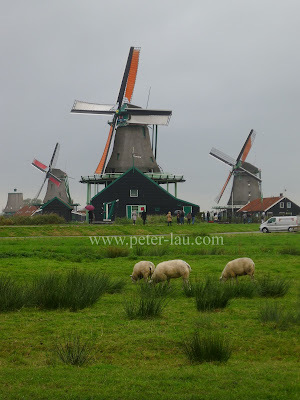 Woke up early and took a train to Zaanse Schans, which is about 20minutes from Amsterdam Central Station. Zaanse Schans has a collection of well-preserved historic windmills and that is the main reason why people go there. While crossing the road bridge, the bridge was being pulled up! First time I saw this. There is a Cheese Farm that is open to the public for free. I went in and tried all the different types of cheese they got to offer. I was actually quite hungry so I went to try all the cheese again. Let me tell you, the cheese was so good that I had to try it again. And again. And again. And again. In the end, I wasn't sure how many rounds of cheese I ate. All I know is that I felt really cheesy after that. I bought some cheese back too! Beside the Cheese Farm there is Wooden Shoe Workshop. Inside, there is a huge collection of different types of clogs and they show you how the clogs were made. After eating so much cheese, I just had to take some cheesy pictures. Went back to Amsterdam at about 12:30pm. Look at the number of bicycles! They even have multi-storey parking for bicycles! Amsterdam is also the home of Heineken. So I went to this place called The Heineken Experience which used to be a Heineken brewery. I didn't go in for the "experience" because it cost 16 euros!!! That is very very expensive! After that, I went to the supermarket to buy Salami for my dinner. Super salty....but cheap. Went back to the hostel to rest for the night. The next morning I was heading to Frankfurt, Germany! After eating so many types of Dutch Cheese, MY LIFE WAS NEVER, EEEEEEEEEEEEEEEEEEEE........................................EEEE.........................................EEVER, THE SAME, AGAIN!! !